The Seiko EPD is a design concept watch, a prototype, but something very much like it will go on sale in the 2010 Northern Hemisphere autumn. A forebear of this watch was a prizewinner at the 2006 Grand Prix d’Horlogerie de Genève, kind of a big deal in the watchmaking world. The big deal about this watch is the screen technology. It uses an Electrophoretic Display, hence the EPD in the name of the watch. EPD uses electronic ink technology – the very same type of technology so lauded for its readability in Amazon Kindle. Easy on the eyes, and eminently readable, even in the sunlight. It had a very wide viewing angle, almost 180-degrees, and displays 80,000 pixels, each of which can display one of four grey scale shades. Like the Kindle, the Seiko EPD concept watch has a very low power consumption. But Seiko have gone a few steps better with power-saving. The screen of the Seiko EPD uses just 1/100th of the power that would be needed to run an e-book reader using the same sized screen. 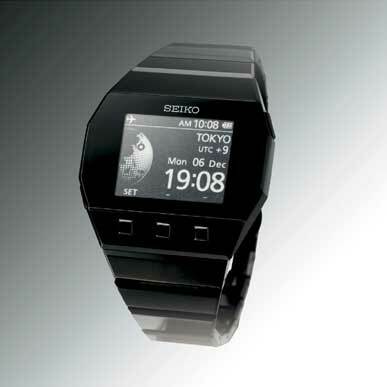 Seiko have today confirmed to me by email that the Seiko Electronic Ink watch will be on sale near the end of 2010, and the price will be somewhere in the region of AU $2,000.